An important element in prospect theory is the finding that people experience gains and losses differently. In particular, research by Kahneman and Tversky suggests that people prefer avoiding losses twice as much as acquiring gains. This kind of behavior is called loss aversion. On this page, we provide a simple example that explains the concept of loss aversion. By not taking the gamble for gains between $10 and over $20, people are leaving a lot of money on the table. Loss aversion also plays an important role in explaining sunk cost effects. In particular, when people have spent money on something, they feel obliged to commit to it. For example, people tend to feel obliged to go to an event for which they have bought a ticket, even if they no longer really want to attend the event. They feel that they would be wasting the ticket price. While such behavior is ineffcient because it misallocates resources, people don’t want to waste resources (loss aversion). 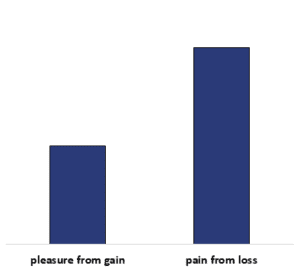 Loss aversion is the empirical observation that people tend to avoid losses, even in case where they should be indifferent to different outcomes.